Jon Moodey for Black Rock FC will be visiting Bermuda over this weekend to observe the talent pool and identify prospective student athletes interested to enroll I the Black Rock Residential Soccer program and boarding schools in the New England area. The Bermuda Football Coaches Association has collaborated with the Bermuda Football Association to help develop an itinerary for Jon to view various youth and senior league matches, as well as National Academy Showcase games. Moodey has been working to assist Bermudian players and families with placing student athletes in prep and boarding schools for several years. Previously he was the head coach at Berkshire School, where he worked with Bermudian players such as Zeiko Lewis, Justin Donawa, and Ahria Simons – to name a few. Each of these players were outstanding athletes and exceptional students in the classroom, moving on to receive scholarships at prestigious universities. Both Zeiko and Justin were drafted by the MLS following graduation from their respective colleges. Moodey has since left Berkshire to help developed the Black Rock FC residential program. Black Rock Football Club has established itself as a preeminent club in America having produced many top college players and young professionals. The club has gained national acclaim for its exciting brand of attacking football and its focus on player development both on and off the field. The Black Rock Football Club Residential Academy is the first residential soccer academy in the northeast region of the United States. Student-athletes selected for the BRFC Residential Academy attend prep school and participate in daily soccer-related activities throughout the academic year (August - June). During the fall season, student-athletes play against high level prep and high school teams. During the winter and spring they play top domestic and international club teams. Throughout the year the team will travel to elite showcase events and tournaments across the country. Last year during his visit, Moodey identified Arnezha Astwood, from Warwick Archers, and he is now enrolled in the Black Rock Residential Academy program. The BFCA will host an informational presentation by Moodey, open to all student athletes & parents who want to learn more about the Black Rock and prep school programs. 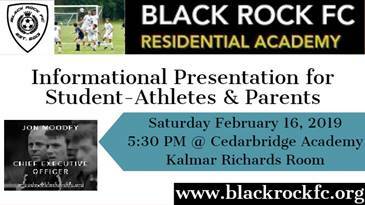 The presentation will be held at Cedarbridge Academy on Saturday February 16th ,starting at 5:30 pm, in the Kalmar Richard’s room on the second floor of the main block.